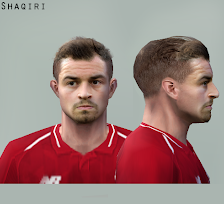 UPDATEPES.com - Shaqiri was one of the best wingers to play for the Liverpool team, he was bought from Stoke City earlier this season. And currently Jurgen Klopp has not gained the trust to play regularly. To complete your Pro Evolution Soccer 6, download it and install its face in the game you play. This update is made by Dewatupai Facemaker, the best facemaker at the moment, let us give credit plus to Dewatupai.